viewing ads - LET'S EARN MONEY TOGETHER ONLINE !! HOW DO YOU VIEW YOUR 20 DAILY ADS? In order to get your daily rebate of 1% of your ad pack purchase ( up to a max of 70% of the value of this ad pack) you are required to view 20 ads on the Adit Network Advertising Platform. -- Log into your Adit Network account. -- Look at the top tabs and click on the ADS TAB. 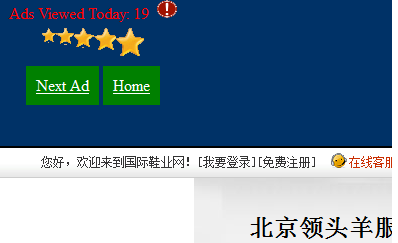 -- Click on these stars and it will open up a link for you to either view the next Ad or return to Home Page. have QUALIFIED FOR TODAY'S BONUS. -- Repeat this procedure every day to ensure you get your daily 1% rebate.